The Medallion stamp guarantee, also referred to as the Medallion signature guarantee, is a special signature guarantee to transfer securities and is seen as a guarantee by the transferring financial institution that the signature is genuine and in the case of forgery, the institution will accept any liability. This signature, in turn, helps protect the shareholder in the case of preventing any unauthorized transfers and/or losses. It can also help limit the liability of the transfer agent who accepts the certificate. You will likely need this signature guarantee when you sell a physical stock certificate in order to prove to the securities agent that you are who you say you are and that you do have the right to sign over the rights to the assets you’re selling. In some cases, you may also need it if you’re gifting or changing ownership on an investment account. A Medallion signature guarantee, commonly available at your local banks, credit unions, and select law firms, will greatly depend on where you go to have it performed. Keep in mind that in order for the institution to participate in the program, the institution in question has to pay an enrollment fee, and even if some institutions find the enrollment fee affordable, many still avoid enrolling since they can be held reliable in the case of a faulty transaction. In most cases, however, DepositAccounts.com notes that, usually, only banks will provide the Medallion stamps if you are a current customer. For example, Wells Fargo, Bank of America and Citibank, to name a few, will only provide the service to its customers, with some banks not only requiring an account but have an account that is at least six to 12 months old. If you currently bank with a brick and mortar bank, be sure to call ahead of time to know if, for one, they offer the service, and secondly, if there are any terms and conditions if you were able to receive the stamp. In conclusion, most banks will offer the Medallion signature stamp for free to their customers, but in the case they do charge, the fees we researched often range anywhere from $10 to $55 per guarantee. First National Bank, for example, charges $40 for each guarantee and is only available to customers of the bank. The bank also notes the transaction dollar limit for the service is $250,000 per transaction. The following nationwide institutions do offer the Medallion signature guarantees for free; however, in order to take advantage, you must be a current account holder and must perform all of the paperwork in person at select locations. Talk with the institution in question for more information. This signature is an official stamp certificate which proves your identity, commonly for financial transactions involving securities. In some cases, before you can buy, sell or transfer a bond, stock or a related financial asset without the use of a broker, a Medallion signature guarantee will protect all parties in the case fraud arises. Depending on which financial institution you use, they may use one of the three programs: STAMP, SEMP or MSP, but regardless of which one is used, they all accomplish the same goal: preventing fraud. To learn more about each program, visit the following links. Only institutions belonging to one of the said programs are able to provide the signature guarantee. 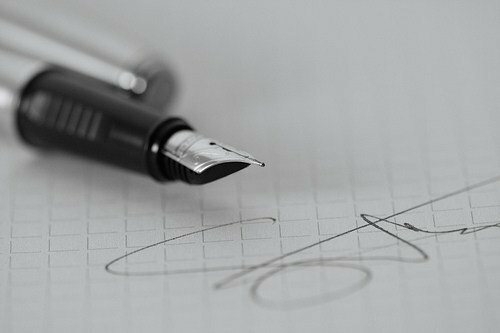 While the Medallion signature guarantee and a notary both use stamps and require a certified professional, these two types of signatures are 100 percent different. A notary can notarize any type of document, whereas a Medallion signature guarantee only focuses on securities. Those who are able to provide a Medallion signature guarantee are trained and certified by the various stock and security exchange organizations as mentioned above, and in addition to this, only green ink can be used for a medallion signature guarantee, whereas a notary will use black ink. Regardless, while both signatures can confirm your identity and make a document official, a Medallion signature guarantee can protect you in the case fraud does arise. Aside from the financial institutions mentioned above, your local bank or credit union may provide the services as well as local brokerage and even some law firms. Regardless of which provider you use, they will almost always ask that you have some sort of relationship with their company before they even consider the service. Where can I get a medallion signature guarantee without an account? Unofruatntely, you’re probably not going to be able to find one as the bank needs to personally vouch for you, and without an account with the bank, in which they need to confirm your identity in depth, no bank will take the responsibility of someone without an account, especially since they will be held reliable in the case of fraudulent activity. Signing up for an account at most banks, however, doesn’t take long at all and is usually free, and doing so, you can receive a medallion signature after the account setup completes. Most institutions will ask that you bring in a photo identification, such as your driver’s license or a passport, and a proof of the transaction value and ownership for the securities in question, which could be a statement detailing the shares you own or the stock certificate. Depending on your circumstances, you may also be asked to bring a probate with appointment letters, proof of power of attorney and/or a death certificate. Be sure to talk with your institution ahead of time to know what you need to bring to your appointment to make sure things go as smooth as possible.